Gua sha has been used for centuries in Asia, in Asian immigrant communities and by acupuncturists and practitioners of traditional East Asian medicine worldwide. Sometimes called ‘coining, spooning or scraping’, Gua sha is defined as instrument-assisted unidirectional press-stroking of a lubricated area of the body surface to intentionally create transitory therapeutic petechiae called ‘sha’ representing extravasation of blood in the subcutis. Modern research shows that Gua sha produces an anti inflammatory and immune protective effect that persists for days following a single treatment accounting for the immediate relief that patients feel from pain, stiffness, fever, chill, cough, wheeze, nausea and vomiting etc, and why Gua sha is effective in acute and chronic internal organ disorders including liver inflammation in hepatitis. 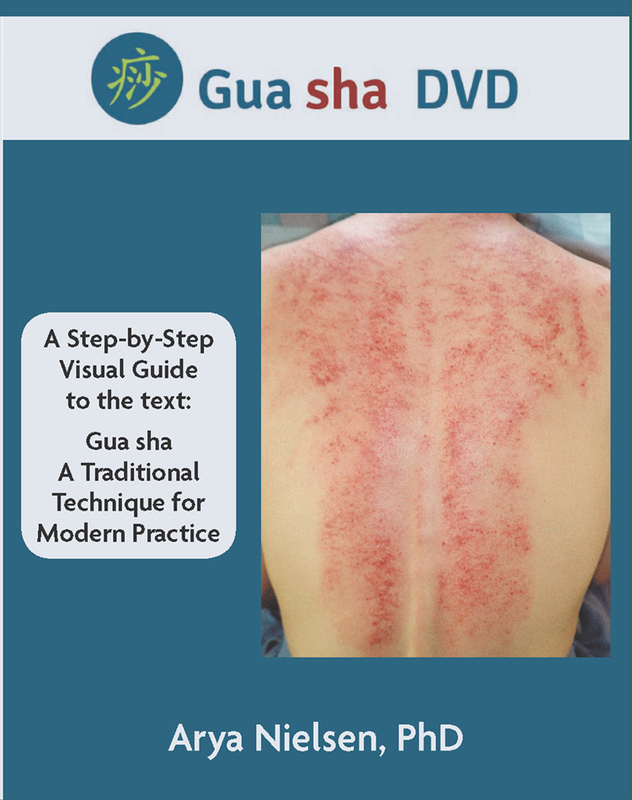 This DVD is a visual companion to the text on Gua sha by Dr. Arya Nielsen. It details the essentials of safe and effective Gua sha practice and shows the step-by-step application of the technique with patients from the First TCM Hospital in Kötzting, Germany. Information from the authors own research is shown including the diagnostic significance of the color of Sha, and immediate Tongue changes as a direct result of Gua Sha. The technique is applicable in any hands on therapeutic practice and will be of particular interest to acupuncturists, massage therapists, physical therapists, physician and nurses practicing direct patient care. Practitioners are encourage to learn Gua sha and its clinical applications from a qualified Gua sha instructor. Dr Arya Nielsen is a practitioner, teacher, author and researcher and is considered the Western authority on Gua sha. Sha has an academic research doctorate and a faculty appointment at a New York teaching hospital, Beth Israel Medical Center where she sees patients and directs the Acupuncture Fellowship for Inpatient Care through the Department of Integrative Medicine. Dr. Nielsen teaches internationally on topics related to East Asian medicine and Integrative medicine. She developed and directs the Gua sha Certification Course. I have the webdesigner Severyn Skoug from Minneapolis to thank for this. He took all of my annoying emails and preferences and made a thing of beauty. And it took awhile. Thanks Sev. Am just learning the blogging part. Teaching this medicine…and representing with science and clarity…that I have aspired to for some time. Thanks for posting. I am continuously surirpsed by what I hear about Gua Sha. It seems to treat so many different things. I recently hurt my neck after too many hours on the computer and I could barely turn my head left or right. My acupuncturist did gua sha and it worked in only one treatment. Maybe this is not amazing to some people, but I am used to something like this taking days to heal or lots of chiropractor or massage appointments to fix it. yes in Chinese medicine it is the resolution of blood stasis. this only gets resolved by sweating from a true fever or this technique. So if neck pain is treated with other means, it may remain incipient until the blood stasis is cleared. Thank you for posting your experience. I was very glad to discover this site on google.I wanted to say many thanks to you with regard to this good article!! I undoubtedlyenjoyed every little bit of it and I’ve you bookmarked to have a look at new stuff you post. Thanks for your message. I am just figuring out how to exchange on my blog…appreciate your patience. I really want to get certified in gua Sha but no one teaches it around here. Can i go online and get certified? I recommend the Certification course…we are filming lectures now and then we will create a way to have an in person hands-on seminar. I look forward to meeting you. Whats up are using WordPress for your site platform? I’m new to the blog world but I’m trying to get started and create my own. Do you need any html coding knowledge to make your own blog? Any help would be greatly appreciated! I like WordPress…my computer guy set up it up with my content…he is in MN. I clicked on your practice tools button above for the Patient hand out on Gua Sha and was not able to get anything. Is this not functioning? Could you send me a link? I learned Gua sha by reading Arya Nielsen’s book. I now know why she says it is the best technique….